It used to be called the Bag Factory. 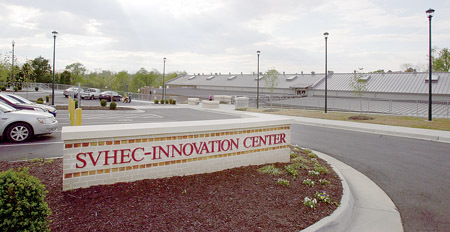 Today, the name is ditched for something entirely more glamorous and appropriate: the Innovation Center – an expansion of the Southern Virginia Higher Education Center, two doors away. A $10 million complex, the Innovation Center is a model of industrial chic – a new jewel in South Boston’s Warehouse District that includes the Higher Ed Center itself and, in between, The Prizery arts center. But it’s more than a pretty face and an old building saved. It’s a place where people can do and learn things – as Halifax Education Foundation Development Director Tommy Nelson explains, it’s the space for the more non-traditional pursuit; the main building now focuses on the more traditional student. Activities in the Innovation Center are geared to jobs: skills re-training for individuals or specialty training at the request of a business. Area employers are taking notice – it’s now one of the first stops for economic development prospects – but Nelson hopes the weekend’s open house will raise its profile even higher: “Somebody’s going to see something on Sunday” that will spark conversations or phone calls. Grace Baptist Church has once again decided to expand. 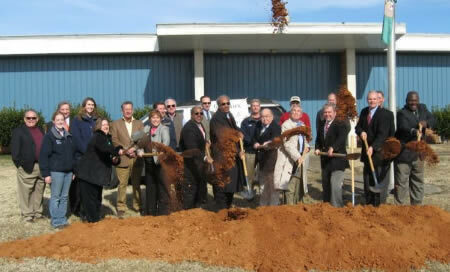 In November 2011 construction began on a two-phase project at the 1058 Buckshoal Road church that ultimately will serve as a Family Life Center gymnasium. According to Associate Pastor Dave Cline, the first phase will include the construction of seven complete classrooms to serve both the church’s Awana program and Sunday school. In phase two, depending on space, an additional 12 classrooms will be added upstairs. The church voted to adopt immediate long-term and short-term goals for the plans of the church in 2007, and according to Cline, the idea for the gym has been 10 years in the making. “We’ve talked about it for several years, the building of a gym, and there have been times when a Sunday school class would be completely full and need to start a new class, and there was nowhere to put them. There’s always a sense to grow for God and the Kingdom,” said Cline. In developing building plans, the church considered that in the future the building may be used for a school. A ceremonial groundbreaking Tuesday morning launched the transformation of the 438,000 square foot Green View Advanced Manufacturing Center that for the past two decades has sat as a silent reminder of better times. At a small “launching” ceremony, a group of officials from around the county gathered to christen the relic as the Green View Advanced Manufacturing Center. “Today the Halifax County Industrial Development Authority (IDA) takes steps to make it a beacon for the future,” said IDA Executive Director Mike Sexton. The former Daystrom Furniture Plant on Greens Folly Road began operation in the 1960s and in its heyday employed more than 1,000 workers cranking out chrome-plated furniture for the world, Sexton said in a release prepared for the groundbreaking event. “It is our hope that today we begin a new chapter for Halifax County, looking forward to bringing manufacturing jobs back to this area that has such a strong tradition of manufacturing. It is exciting to think of this building coming back to life and seeing people going to work here everyday,” Sexton said. Green View Advanced Manufacturing Center sits on approximately 34 acres and is serviced by all utilities and rail, according to IDA Development Director Patsy Vaughan. The site contains four buildings that have about 430,000 square feet with the largest containing about 320,000 square feet. 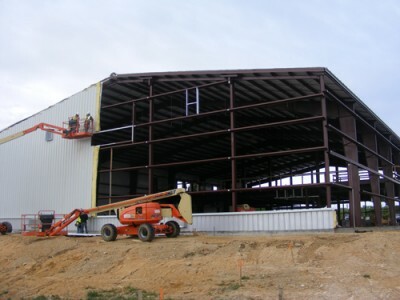 “Building 1 is ideally constructed to develop as a launching pad for small to mid-sized manufacturing operations. We hope that we can place manufacturers in the building, and as they grow, spin them out to stand alone locations elsewhere in the county,” Vaughan said. The building is currently being prepared for tenants by local firms J. E. Burton Construction and McDannald Construction. Phase I site work is continuing at the location of the future NOVI Energy wood-fired power plant off Plywood Road in South Boston, and on the other side of town, roof demolition on the former Daystrom building got under way Monday. J. E. Burton Construction Co. has been awarded the contract for both jobs. Grading and foundation construction at the power plant site continues after the IDA closed on the NOVI property Dec. 19. The major contract for construction of the plant is expected to be awarded in April, according to Halifax County Industrial Development Authority (IDA) Executive Director Mike Sexton. NOVI Energy announced plans to spend approximately $150 million to construct the plant that is expected to go on-line in 2013 creating 40 full-time jobs and $700,000 in new taxes annually. An additional 75 jobs are expected to be created in the agribusiness sector to fill the needs for fueling the power plant, IDA officials said. Mid-Atlantic Broadband Cooperative (MBC) held a ribbon cutting Monday to usher in a new era of expansion of broadband throughout Southern Virginia. The company, which is headquartered at Riverstone Technology Park (RTP) in South Boston, has completed expanding their offices to make room for 25 new employees, and they plan to add an additional 75 throughout their service area in support of their construction of over 400 miles of new fiber routes. Once the $20 million expansion program is completed, MBC will have increased their fiber routes to 1,500 miles, according to Halifax County Industrial Development Authority (IDA) officials. Members of the Burton family, school officials and students cut the ribbon Thursday morning officially opening the J. E. Burton Construction Company Inc. Pro-Engineering Computer Aided Design (CAD) Lab at the STEM Center. The laboratory features 20 complete computer stations equipped with Pro-Engineer CAD software. Superintendent Paul Stapleton said Governor Tim Kaine chose four school divisions in the state to receive a million dollars worth of the CAD software that all the major businesses around the world are using. Burton donated the computers and other hardware needed to run the new CAD software.